Aesthetically pleasing. Very good looking bag. 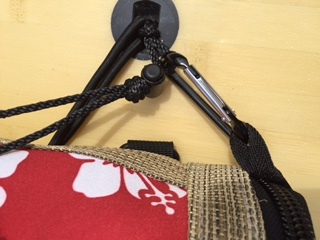 Heavy duty nylon zippers—one at the top and one on the end, 3 D-rings, 4 clips near each corner for attaching to board and 1 clip inside the bag for keys or anything small and important, 2 wide twill loops and adjustable cord to temporarily hold and keep a paddle on the board when not in use. 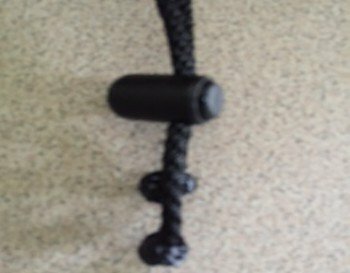 The longer cord attached to the side of the bag is meant to secure your paddle at the shaft when not in use. Extremely simple concept yet functional. Bag top is made of laminated thick neoprene with strips of vinyl mesh strategically placed to reinforce—serves well in terms of function and design. 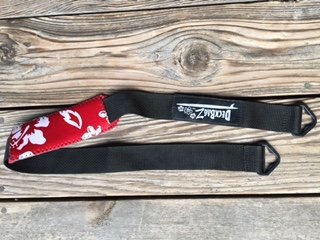 4 cords come with the bag to secure the bag to your board. These cords attach to your existing board d-rings or other deck pins. The cords have what DeckBagz call "loop extenders". These extenders are meant to act as stoppers to keep the bag tight and in position. (See following image - left). At the top of the "loop extender" is a button. When the button is pushed, the cord is released. In this case the "loop extenders" do not hold well. To solve the issue we made a knot at the end of the "loop extender" to keep it in place—an easy solution that worked. (See following image - right). Simply designed. 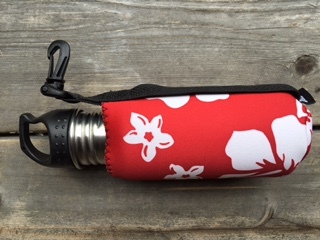 The twill outside handle with clip runs along the length of the holder—uncomplicated and functional—a smart touch. The thick vinyl drybag keeps your things dry from splashes. 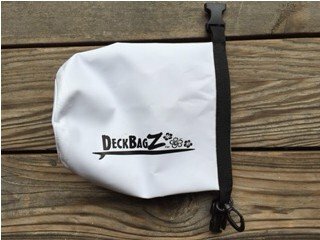 Deckbagz states "this dry bag is not intended to be submerged". This bag is beautiful, sturdy, and functional. For the consumer who wants to make a statement, this eye-catching bag with matching accessories will certainly do that. It wasn't a busy morning on the water during testing although we did get asked by passersby where the bag came from. Perhaps one of the most appreciated attributes is the double zipper feature—opens the full length at the top and at one end. 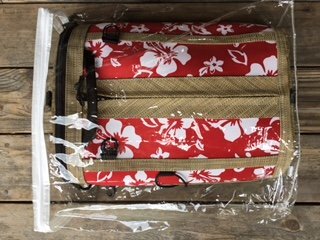 This makes for easy packing and super easy access if you need to stop to get something out of the bag while out on the water. There are plenty of hooks and loops to accommodate the need to attach "SUP things" to the bag. This bag stands out over all others we've seen in terms of style. Not too small, not too big. I could fit a neoprene jacket, another light jacket, a small safety kit, and extra water bottle with room to spare. We suggest better "loop extenders" — ones that grip securely and match the quality of the other components. Outside dimensions 15 1/4 in. x 12 in. Inside dimensions 14 in. x 10 3/4 in. Once we took the SUP pocket out of its plastic zip-locked bag, the first thing noticed was how sturdy it is made; 3/4 in. edging, heavy underside, 1 1/2 in. wide nylon sturdy zipper reinforced with twilled cloth taping along each side of its length. 3/4” wide handle with a 4 3/4” wide opening. A secure "square knot" worked well to tie the cord to the suction cup. The zipper runs the full length of the centre of the bag. The centre positioning allow for QUICK and easy access to everything you place inside. 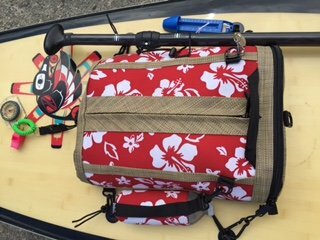 We tested the SUP Pocket with 3 1/2 lbs of things placed inside it; a wind breaker jacket, a Surfstow SUP grip handle, and a few safety supplies. A water bottle was attached to the outside of the bag. This bag easily expands to 4 1/2 in. in height at the centre-middle, slightly tapering in height as things reach the edges. It is a surprise how much volume it holds since it looks so flat coming out of the package—Nice to have the option of flat or expanded as needed. 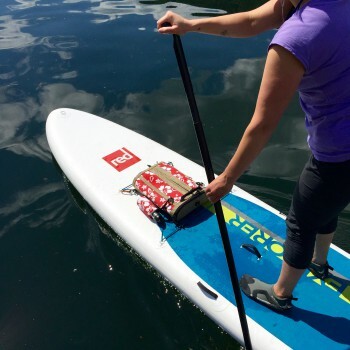 "Adventure Pockets” states on its packaging, “SUP pocket is intended for use on calm water." We agree with this statement because of the diameter of the suction cups (2 1/2” in diameter)). The bag itself is so sturdy that it can easily carry more weight. 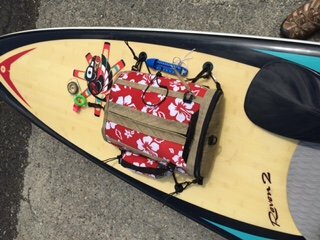 ﻿This bag holds a neoprene jacket, Surfstow SUP grip, a small foam pad and there was still room. The sturdy heavy gauge zipper opens and closes without great effort...very smooth. It is easily accessed while on your board. All parts and materials are heavy duty/gauge. This sturdy bag will hold its own in most SUP scenarios. 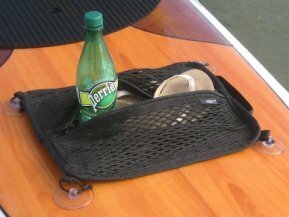 The exterior webbing and extra loops provide plenty of opportunity to strap other items to it. This is a very well made bag. Excellent quality.